A raw food chef is someone who creates delicious raw food cuisine. Here are a few that have contributed to this website and I am featuring their stories and contributions here for inspiration and recipe ideas! My interest in the Living Raw Food lifestyle began in February of 2011. Being from Texas and a "meat and potatoes girl", I felt if I ate only raw foods I would starve…this was a definite misconception. My husband introduced me to a few raw items that were prepared at Whole Foods. When I tried these dishes, I really enjoyed the taste and felt satisfied when I ate them. It was exciting to find there were options beyond "salad". I decided to research the raw food lifestyle further because I wanted to be healthier and I wanted to feel better physically. I came upon Storm and Jinjee's 21 Day Cleanse and purchased it as a birthday gift to myself. My husband and I began the 21 Day Cleanse in April. Almost immediately, I felt better physically, as well as extremely happy. Since the Cleanse, we have completed the 28 Day Transition to Raw Program. When you cook foods, most of the nutrients are lost and you have to consume more to feel full because your body is looking for nutrients. When consuming nutrient rich plant based foods I am satisfied by smaller portions. I am excited to say that within the first five months of living a raw lifestyle I have lost 30 lbs! Not only have I lost weight naturally, but I have the energy to exercise and feel like a fog has been lifted. Since all of the positive changes have occurred, I have been intrigued with Gourmet Raw Food preparation. The first successful dish I prepared was the Raw Strawberry Banana Cheesecake with Fruit Coulis. After experimenting with several different recipes I was able to develop a dessert that debuted on Easter 2011. To my pleasant surprise it was overwhelmingly well received, so much so that it was requested for Mother's Day and all future holiday family gatherings. Now that I have personally experienced how a raw lifestyle can positively impact my own health, I'm determined to share this knowledge with my family and friends. RFDM: Congratulations Natalie on winning first place on the Raw Food Contest with your fabulous Strawberry Banana Cheesecake. And best wishes to you on your raw journey. Holly Wolfey currently lives in St. Louis, MO, with her husband who is in Chiropractic school and she is a mother of 3 young children. She has been eating raw for over 2 years now and enjoys creating raw foods and new recipes. She is currently in the process of obtaining a Wellness Coaching Certification so that she can help people to obtain higher levels of health. 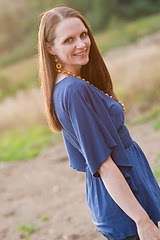 She also dabbles in Craniosacral Therapy and book writing, and hopes to someday publish children's stories that will encourage children to make healthy choices and inspire parents to lead them. RFDM: Congratulations Holly in all that you do. I hope you publish that children's book to inspire parents on how to eat a healthy diet. Jen says, "Working for Whole Foods Market and living the raw food lifestyle for some time now I get a lot of questions on how I decided to switch my diet. It came about when I went to Peru almost 5 years back. I picked up a parasite that invaded my system so much that modern medicine had a difficult time figuring out what to give me to get rid of it. That's when I found a holistic approach and went to learn more at Hippocrates Health Institute in West Palm Beach, Florida. I became a health educator and lived in Florida for a few months getting my certificate. I instantly saw a change in my energy levels, my skin rashes and boils went away and the chronic candida went away. From all the juicing, colonics, and raw foods my health improved immensely. When I returned home, my profession as an actress wasn't satisfying so I decided to create my dream job and help others get healthy with the help of raw foods, minerals, digestive enzymes, probiotics and eating healthy. To supplement my income I help people working at Whole Foods in the vitamin department and teach classes for the store on raw foods. I love teaching Summer classes because there is such a Try my Peachy Passion Cobbler recipe." Thank you Jen for sharing your story and the work that you are doing. Learning from our own experiences is a great way to inspire others.